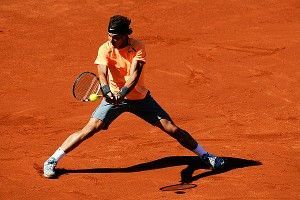 Rafael Nadal, Mallorcan tennis warrior, cemented his status as the king of clay over the past month with 21 straight victories on his favorite surface. On Sunday, he won his seventh Barcelona Open and attained one of those goofy arcane milestones that manages to tell a story of longevity and dominance; he’s now the only player in the Open Era to win two different tournaments seven times. 1. Clay courter extraordinaire (this happened almost from the very beginning), and second fiddle to Roger Federer on grass and hard courts. This began in 2005 when he became the first teenager to win a grand slam (the French Open) since Pete Sampras 15 years earlier. 2. Best player in the world on all surfaces. This began with the epic Wimbledon victory over Federer in 2008, continued through an Olympic gold medal and a Davis Cup victory for Spain, dipped slightly with some tendonitis issues that kept him out of Wimbledon in 2009, and culminated in the dream season of 2010, when he became the first player in the Open Era to win the French, Wimbledon, and U.S. Open in the same year, beating Djokovic in Flushing Meadows to complete the career grand slam. 3. Second fiddle, part two. Novak Djokovic’s 2011 season stands as one of the best in the history of men’s tennis. It began with a 43-match win streak, three grand slams, and a world no. 1 ranking in July. He also beat Nadal in all six finals they played that year, including Wimbledon and the U.S. Open. The streak continued into 2012 with an epic victory over Rafa in the Australian Open final. Even more amazingly, he won both meetings on clay, in the Madrid and Rome finals. If not for a heartbreaking loss to Federer in the French Open semis, a tournament Rafa won, he might have won the grand slam. Anyone who watched Federer sob at the conclusion of the 2009 Australian Open, a five-set match that saw him physically and emotionally broken by Nadal (“God, it’s killing me,” he said after the match, just before breaking down), knew that Nadal had his number. Probably forever, or at least enough to ensure that his 18-10 head-to-head advantage never narrows. Which isn’t to say that Federer can’t win matches against him; that’s happened four times since. But in their last five meetings in majors, Nadal has dropped just five total sets, and Federer always seems to adopt the same expression as things go south. I call it “haughty misery;” a tight-lipped moue meant to disguise the fact that he’s dying inside. The whole thing is very strange, because Federer is one of the truly great pressure performers of all time. His exploits are too numerous to mention (ask Andy Roddick), and he was the only one who could touch Djokovic during the 2011 season; he beat him at the French, and would have done the same at the U.S. Open if not for a very lucky and very desperate forehand blast by the Serb to save the first of two match points. But there’s some mental edge, a grit-over-beauty dynamic, that gives Nadal a leg up on his rival. He even acknowledged it in Rafa, a notable admission for someone whose defining off-the-court trait is humility. In overcoming Federer, Nadal had a few advantages. First, Roger had never been good enough to beat him on clay. Second, the mental thing. Third, he had a plan: hit the ball with absurd amounts of top spin to Federer’s backhand side, over and over and over. It was a simple formula, but he stuck to it with a monastic fervor, and as he improved his serve and tailored his game to harder surfaces, it eventually paid off. Djokovic is different. Where Roger started out clutch and only began to psychologically crumble against Rafa with time, Novak has taken the opposite trajectory. The knock on him was always that despite his great talent, he disappeared in big matches. This was Andy Roddick part two, a man of extreme talent who would probably only win one or two majors because he couldn’t cut it under the bright lights. But his talent far exceeded Roddick’s, and in 2011, everything came together. Suddenly, he was one of the most ice-cold pressure performers on tour. I already mentioned saving two match points against Federer’s serve in the U.S. Open semifinal, but an even more telling moment came in the Australian Open final against Nadal this January. After Novak two of the first three sets and going up a break in the fourth, Rafa charged back, playing above his head and taking the fight to Djokovic. It was the best he’d looked against the Serb in two years, and he won in a tiebreaker, forcing a fifth set. It felt like the prototypical Nadal grand slam win; use speed and consistency and a life-or-death style to turn the match into a battle of nerves, and then prevail when the opponent inevitably broke down. But it didn’t happen; Novak steeled himself and won the final set 7-5. The ordeal lasted almost six hours, and marked the most epic win of Djokovic’s career. In summary: 1. Rafa can’t count on the mental edge. 2. He’s admitted that unlike with Federer, he has no real plan on how to beat Djokovic, whose game is fluid and free of noticeable weak spots. 3. Djokovic is good enough to beat him on clay. There’s a common theme — when Nadal is the underdog, playing against him just gets harder and harder. With the 2012 major season less than a month away, one of the game’s great champions will be digging deep to reach the top of that second, legend-making peak. 2012 NFL Draft: Did the Browns Blow It?